After the gospel itself, the greatest need of the Christian church is to keep finding and training people who will faithfully teach the Bible to both Christians and non-Christians. How can we discover these individuals? How can we help them develop in both Christian commitment and ministry competence? This handbook is part of the answer. It's about recruiting godly, ministry-hearted Christians, placing them under the guiding hand of an experienced minister, and giving them a two-year full-immersion experience of working for a church or related ministry. It's about ministry apprenticeship. The insights and programmes in Passing the Baton are based on 25 years of experience in running ministry apprenticeships as part of the 'Ministry Training Strategy' (MTS). This programme, initiated by Colin Marshall and Phillip Jensen at the University of NSW in Sydney in the early 1980s, has been developed, copied, refined and implemented in many parts of Australia and the world, including Britain, France, Canada, the Republic of Ireland, Northern Ireland, Singapore, New Zealand, Taiwan, Japan, and South Africa. For many, it has been a revolution. In this convenient handbook, you'll find an introduction to the what, why and how of ministry apprenticeship, including first-hand testimonies from trainers and apprentices, and loads of detailed information and practical suggestions about how to set up, run and maintain a ministry training programme in your local church or fellowship. 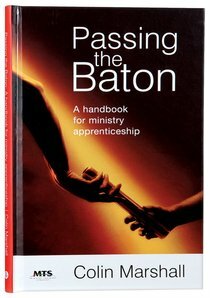 For ministers who see the need for such training in their churches, or potential trainees who want to understand what apprenticeship is about, Passing the Baton is the place to start. About "Passing the Baton: A Handbook For Ministry Apprenticeship"
Colin Marshall studied theology at Moore College and is the author of Growth Groups, a book on leading better small groups. He has spent many years involved in training others in ministry, and directed the Ministry Training Strategy until 2006. Customer Reviews For "Passing the Baton: A Handbook For Ministry Apprenticeship"
This is the most comprehensive book I have ever read that deals with transitions in ministry. It's always the problem with every church and ministry I have ever know. Not only the ethos, culture and processes involved, but making sure there is a period of intentional training and development. The humility of the author on page 13: "This handbook is designed to be a guide and a resource, not a rule book. It will serve it's function best when trainers and apprentices adapt the ideas, tools and methods to their own local context....". I love this idea!